WARNING: YourCPL is old software due for retirement or a rewrite. It is incompatible with Windows 8. Sort of works with Windows 7 and probably Vista too. Plays nicely with golden oldies like XP and earlier. I do not know if it has a future – see note at bottom of page. 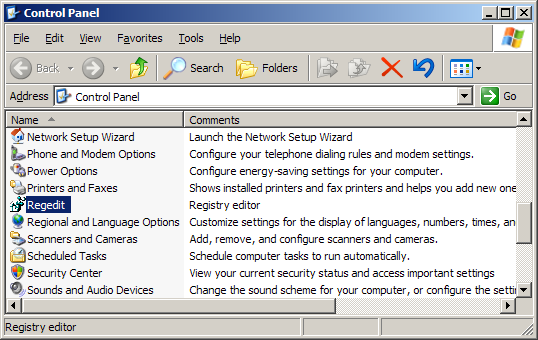 Some programs belong in Control Panel, being configuration tools, but are not supplied in the special format required to be Control Panel applets. Applets are a special type of DLL written in a way that Windows recognises and interacts with and lists in the Control Panel folder. YourCPL is a Control Panel applet designed to extract information from normal programs and a configuration file, and present it to Windows. The combination of ordinary program and generic applet enables anything that can be put on a command line to be represented in Control Panel. In the above screen shot you can see that I have added Regedit.exe in Windows XP. Note that the ; must be the first character on the line. So that will be one line when you type it in. Command line arguments are optional. All other fields are obligatory. Examples are given in the text files in the download package along with further comments, troubleshooting tips and special notes for Windows 7. I wrote YourCPL for an old version of Windows in which Control Panel looked different. Control Panel applets had to be created in a particular way and YourCPL does exactly that. Things have changed. Control Panel is structured differently and the old way of building applets has been superseded by one that looks simpler and more sensible. The old method can be made to work, certainly up to Windows 7, but it's a dead end and may be incompatible with Windows 8. YourCPL is therefore obsolete for modern versions of Windows. If it is to survive in some form, it will have to be re-thought, re-written and gain a user interface. I don't know if I will get round to it. If I do, this is a note to myself: the current documentation on implementing Control Panel items is at http://msdn.microsoft.com/en-us/library/windows/desktop/cc144185(v=vs.85).aspx. Well if you are desperate but cannot find an alternative and do not want to hire someone, Google finds pages that tell how to put a standard	executable file in Control Panel by means of registry edits. I haven't tested this so I am not providing links. However, the approach seems to agree with Microsoft's current Control Panel documentation. Description / note Windows 7 with caveats. See the instructions.